Eleven weeks? How about that? As we begin August, we’re starting to go slightly crazy with this project we started at the beginning of the summer. Still, we’re hoping to finish our last month strong before we return back to school for our final semesters. Let’s take a look at this week’s sketches, shall we? 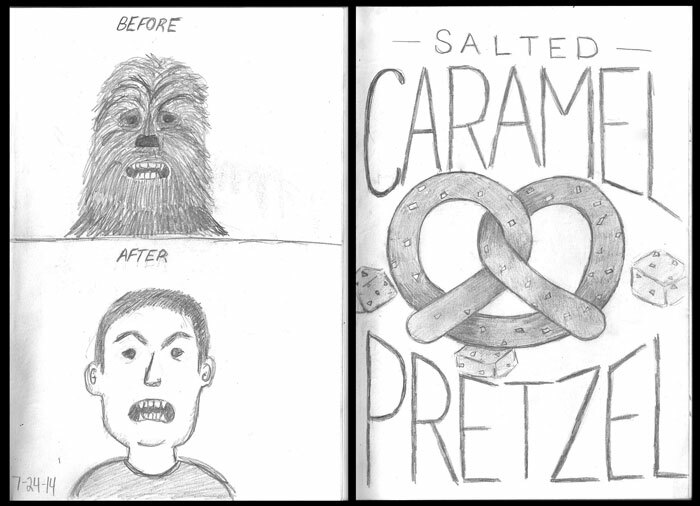 Day 71: Sean reveals himself to be a Wookie before a much needed haircut, while Stef recalls her delicious Salted Caramel Pretzel ice cream she had from Dairy Queen shortly after Sean got his ears lowered. 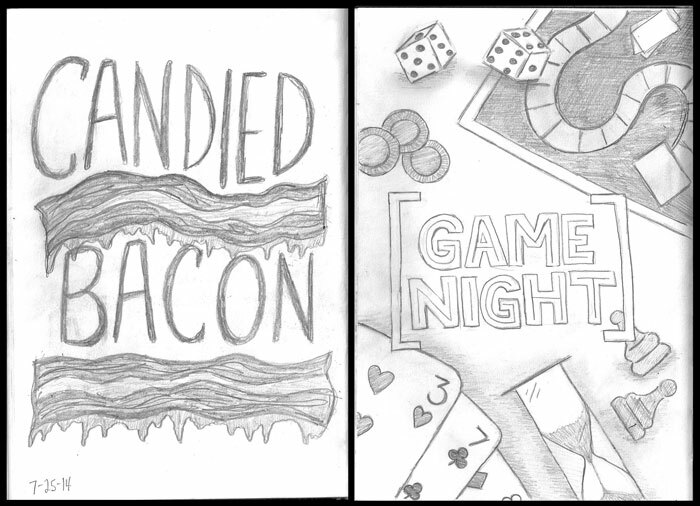 Day 72: An exciting day of cooking and playing games with our friends over at C & C’s Kitchen led to these fun sketches. Sean draws the delicious candied bacon he whipped up for everybody that day, while Stef sketches out some of the fun games we played. Day 73: Sean turns up the TURBO BASS and everybody starts dancing with his sketch of the Lonely Island classic. 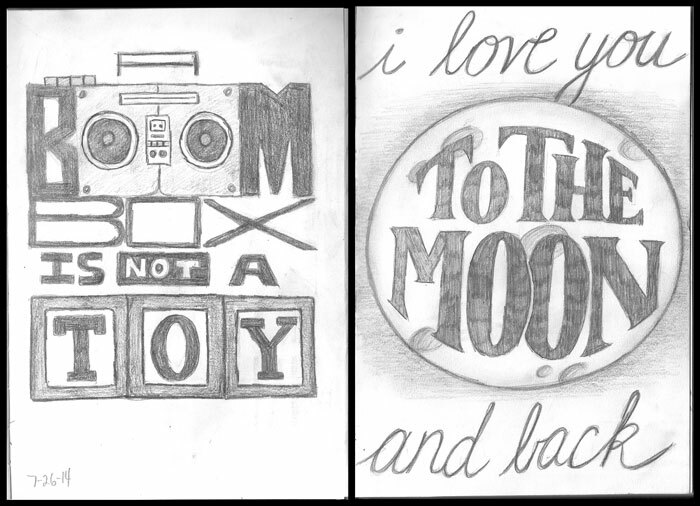 Stef’s lovely typography skills leads to this beautiful sketch of the moon (and back!). 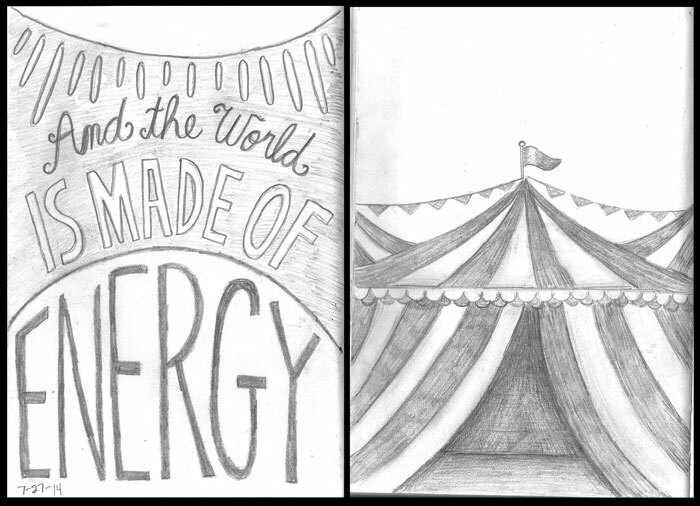 Day 74: A quick look at one of Sean’s old school projects inspires Stef to draw this carnival big top tent. Sean grabs a lyric from an Apples in Stereo tune for this energizing sketch. 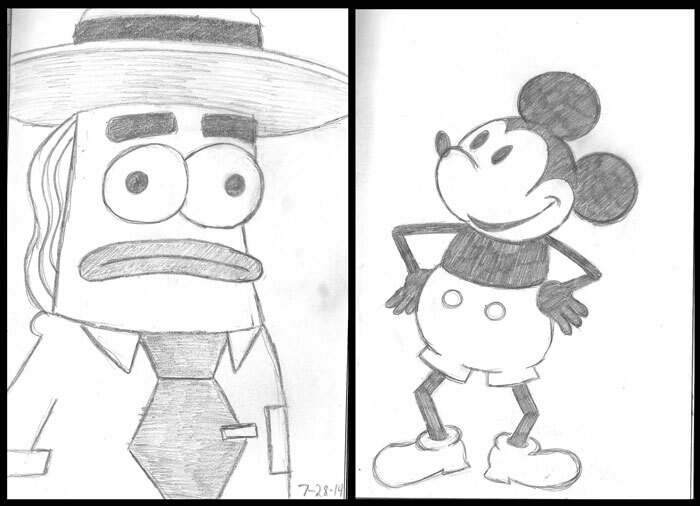 Day 75: Sean gets some advice from the great Magic Conch Shell and does nothing (except draw the park ranger’s expressionless face), while Stef throws it old-school with her take on vintage Mickey Mouse. Day 76: Sean can’t believe it’s taken him this long to draw anything from his favorite television show, but finally gets it done on day 76 with Homer and his brew of choice. 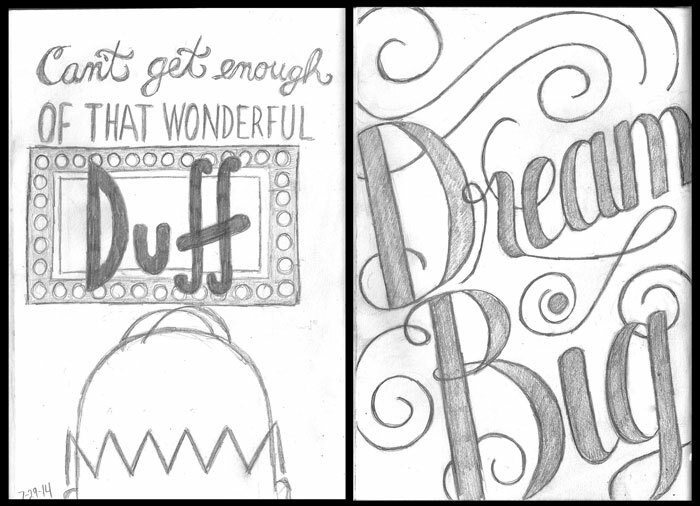 Stef draws some lovely curls with this inspirational typography. Day 77: ***Theme: LEFT-HANDED BANANAS?!? *** So this theme was more of an experiment than anything else. Sean takes up the challenge of drawing with his less dominant hand by drawing…some weird looking guy with with a banana peel on his head. 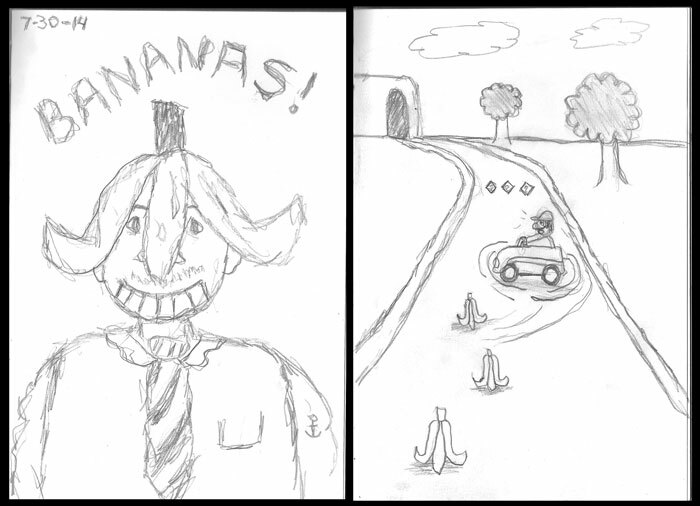 Stef does a much nicer job with her left-handed sketch and draws Mario peeling out on a banana. Okay! One more week in the books! A pretty fun week for both of us with some really inspired sketches.Keep on the lookout for some more blog posts coming soon. We’ll be back with another round of sketches next week!